Although many researchers have examined the prevalence of stereotypy in individuals with developmental disabilities, the results of previous studies have not been aggregated and analyzed methodically. Thus, we conducted a systematic review of studies reporting the prevalence of stereotypy in individuals with developmental disabilities. Our results indicated that the average prevalence of stereotypy across studies was 61 % and that individuals with autism spectrum disorders had the highest reported prevalence (i.e., 88 %) across specific diagnoses. Children and adults generally had similar overall prevalence measures, but the specific forms varied with age and diagnosis. 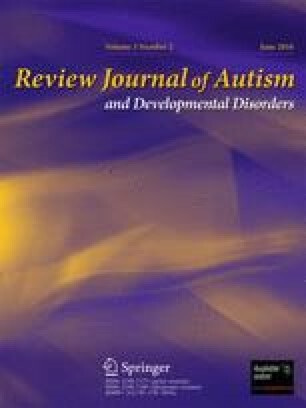 Studies using the Repetitive Behavior Scale-Revised and the Autism Diagnostic Schedule-Revised generally reported higher estimates of prevalence of specific forms of stereotypy when compared to the Behavior Problem Inventory. However, the latter seemed more sensitive than the Aberrant Behavior Checklist for overall prevalence. Studies with a low risk of bias found a lower prevalence of stereotypy than those with a high risk of bias. Our systematic review underlines the importance of continuing research efforts to improve the assessment and treatment of stereotypy in individuals with developmental disabilities. The preparation of this manuscript was supported in part by a doctoral research scholarship from the Fonds de Recherche du Québec – Société et Culture to the first author and a salary award from the Fonds de Recherche du Québec – Santé (no. 30827) to the third author. Lanovaz, M. J., & Sladeczek, I. E. (2012). Vocal stereotypy in children with autism spectrum disorders: a review of behavioral interventions. Behavior Modification, 36, 146–164. doi: 10.1177/0145445511427192.